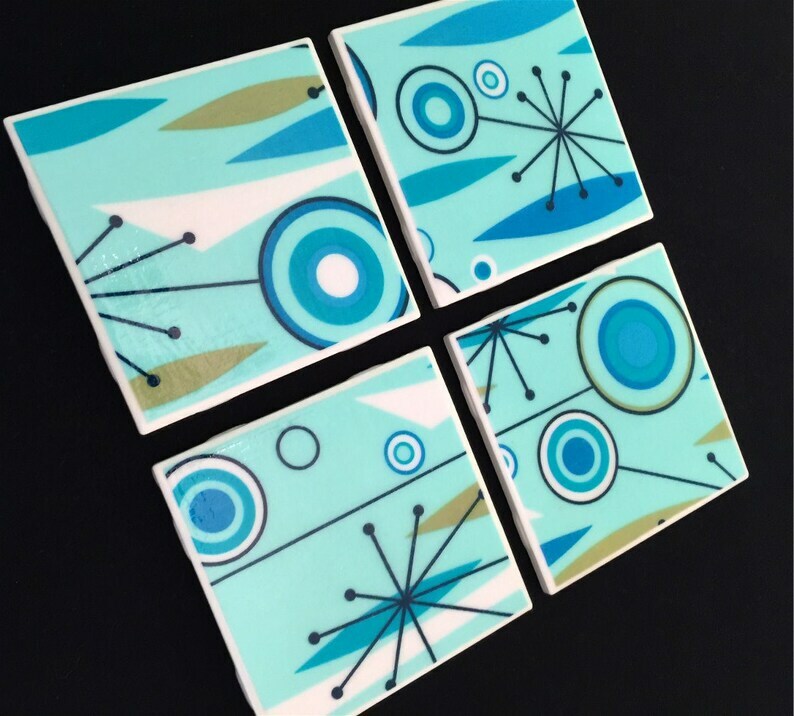 TURQUOISE BLUE, Robin's Egg Blue, Teal Blue, Sky Blue, Spa Blue, Baby Blue, Pistachio Green and White - Ceramic Tiles - Set of 4 - approx 4" x 4"
I don't know who would love these more...Judy, Jane, Elroy or George Jetson, but, I know that you will delight in them! Space Age, Jetsons Atomic Starburst pattern is so much fun, you may not want to give them as a gift, but, keep them for yourself! Set of 4 tile coasters with Atomic Jetson fabric on top and cork on the back to protect your fine furniture! NOTE: Pattern may vary from photos, yet still look fabulous, as I cut each set from my fabrics to get the most interesting parts of the pattern! These coasters are amazing!! Thank you so much! These are even more beautiful than the photos. The colours are stunning. Delighted with them.